Lowdown: The story of Britain’s decision to have a go at fighting WW2, on its own, as told through the personal story of Churchill’s early days as PM. 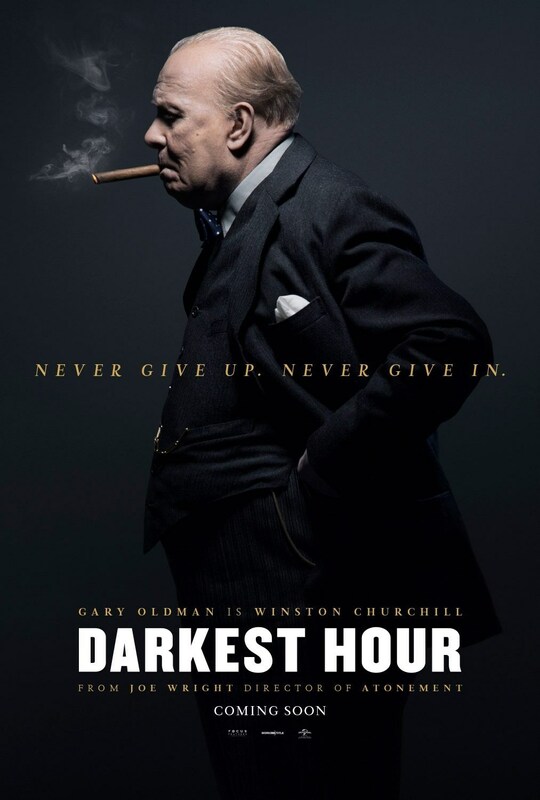 Darkest Hour, if you recall the person who coined that phrase, is the story of Winston Churchill’s first days as Prime Minister of the UK during early 1940. As you may know, WW2 officially started on 1 September 1939 with Germany’s military invasion of Poland (though, it has to be said, fighting was already going on in earnest in China for a while by then). War in Europe was declared, but not fought; the Allies did not come to Poland’s help, and especially in France the soldiers did not know what to do with themselves. In the UK, the subject of our movie, people were still calling to try and appease Hitler despite repeated failures. Which is where Churchill fits into the picture, appointed as Prime Minister after his predecessor (Neville Chamberlain) was stained for his Munich Agreement’s false notion of containing Hitler. By then, German soldiers were pouring over Belgium and into France, and crisis was at hand. The entire British army, in France, was about to be driven into the sea (thus lost); what should the British government do? Enter Churchill (Gary Oldman) and this movie about him and the decisions he had made at that early stage. Decisions that determined on the course of WW2, and, for the UK, eventual victory at the price of the loss of the British Empire. If there is one theme to take out of Darkest Hour is that is is, indeed, very dark, as the movie name suggest. Not so much in contents as it is in absence of light, enclosed rooms, and dark walls. England sure was a depressing place, if you take this movie’s word. The main struggle in our movie is not with the UK contending against the menace of the all conquering Nazis as it is with the UK facing its own demons: the people who wished to negotiate and appease the Nazis. We should be able to relate to them: they were not, necessarily, Nazi sympathisers; they were people who remembered all too well the cost of The Great War. According to Darkest Hour, they almost won the day. But Churchill saved it, with a little help from his friends, king, and country. Darkest Hour takes some liberties with historical truths (for example, it has Churchill mingling with the commoners, including a black person, on an underground train as a key pivotal scene in which Churchill makes his mind up to fight). Which is where my biggest problem with the movie lies, its portrayal of Churchill as an almost perfect person barring his drinking habits. Well, he wasn’t; sure, he did many great things in the war against Nazism, but he was also responsible for many atrocities and initiatives in the field (check out this fine example, revealed only recently). These receive only an afterthought in our movie. In doing so, Darkest Hour steps into the realm of propaganda. Acting wise, there is no denying Gary Oldman does an excellent job, yet there is no denying I found it hard to attach myself to the character he portrayed underneath all that makeup. I won’t argue whether he deserves his Academy Award for this role or not (I can offer numerous other movies where he fully deserves all accolades); I just don’t think, the way the Academy seems to, that being covered in extra layers of makeup is a precondition for acquiring the award. As films go, Darkest Hour is a fine drama. I, however, have a big problem with the way rough edges have been rounded in order to generate a favourable image for the person that we, with the privilege of hindsight, know to be the winner of that particular fight. I will therefore go with a rating of 3 out of 5 crabs. can be aware of it. Therefore that's why this piece of writing is perfect.